12 Jyotirlinga Yatra tour package takes you to all the worship places of Lord Shiva. The famous Jyotirlingas are placed in the eight states of Gujarat, Maharashtra, Madhya Pradesh, Tamil Nadu, Andhra Pradesh, Jharkhand, and Uttarakhand. Devotees from all over the world set out on 12 Jyotirlinga Yatra to seek the blessings of Lord Shiva and to get blessed. This tour is perfect for the spiritually inclined to get drenched in the divinity of Lord Shiva and offer their prayers. It is believed that those who visit the holy sites of Jyotirlingas in their lifetime attain all the Siddh is and powers. The 12 Jyotirlinga Yatra is believed to rid you of all your sins and provide purity to the soul. Welcome to Jamnagar! As soon as you land, our local representative will assist you and transfer you to Dwarka. Once you reach, check-in to the hotel and settle in. 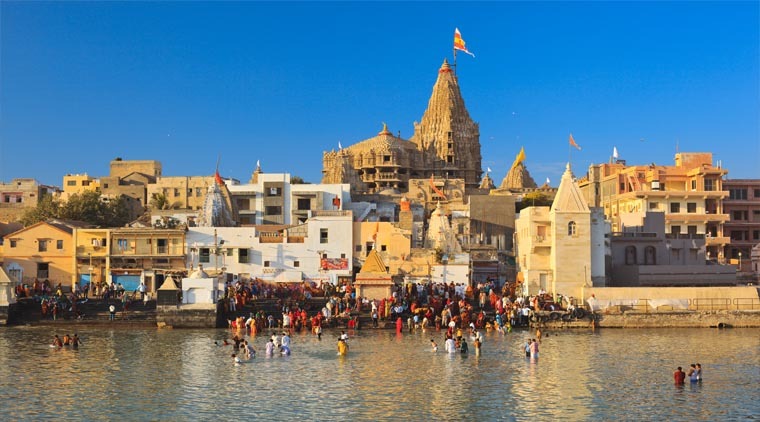 In the evening, you can visit the highly revered Dwarkadhish Temple on your 12 Jyotirlinga tour package, which is dedicated to Lord Krishna and offer your prayers. The temple dates back to more than 1400 years and displays intricate carvings on its walls and interiors. Head back to the hotel for your overnight stay. On day 2 of your 12 Jyotirlinga tour package, begin your day with a healthy breakfast and then check out of the hotel. Drive to Bet Dwarka. Also, popularly known as "Kingdom of Lord Krishna", this is where the Lord spent endless hours of togetherness with his wife, Rukmani. On the way, visit the famous NageshwarJyotirlinga and Rukmani Temple on your 12 Jyotirlinga tour package. After lunch, drive to Somnath via Porbandar. As you reach the hotel, check-in and freshen up. In the evening, visit the SomnathJyotirlinga on your 12 Jyotirlinga tour package and seek the blessings of the deity. 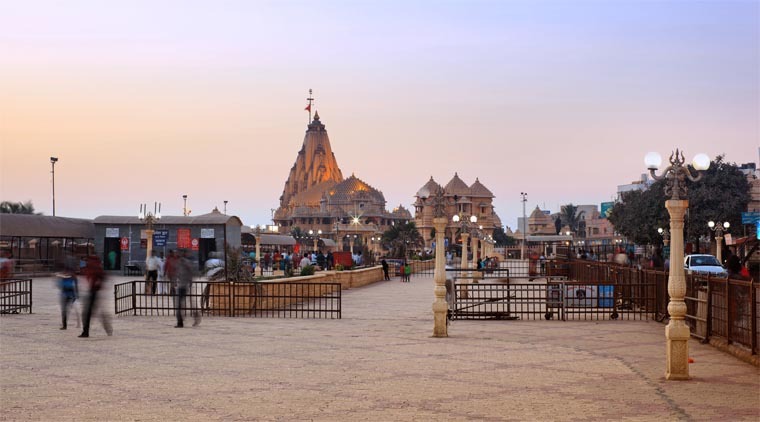 On day 3 of your 12 Jyotirlinga tour package, start your day early with the morning darshan of Somnath Temple. After the darshan, head back to the hotel and enjoy a scrumptious breakfast. Post that, check out of the hotel and transfer to Diu Airport by road to board your flight to Mumbai. As soon as you land in Mumbai, transfer to Trimbakeshwar by road. As soon as you reach, check-in to the hotel and relax. Visit the well-known Trimbakeshwar Temple and the holy Trimbakeshwar Jyotirlinga in Nasik on your 12 Jyotirlinga tour package. On day 4 of your 12 Jyotirlinga tour package, begin your day with a healthy breakfast and check out of the hotel. Make your way to Bhimashankar by road. Visit another jyotirlinga inside Bhimashankar Temple on your 12 Jyotirlinga tour package. After your puja, drive further to ShaniShingnapur, which is dedicated to Lord Shani. Later, continue your journey to Shirdi, the holy abode of Sai Baba. As you reach Shirdi, check-in to the hotel and settle in. Enjoy your overnight stay at the hotel. On day 5 of your 12 Jyotirlinga tour package, start your day early and visit the Shirdi Sai Temple to attend the KakadAarti. After your darshan, head back to the hotel and enjoy a lavish breakfast. Later, check out of the hotel and transfer to Grishneshwar. On your 12 Jyotirlinga tour package, pay a visit to the sacred Grishneshwar Mahadev Jyotirlinga and seek the blessings of the Lord. After the darshan, drive to Aurangabad. As you reach, check-in to the hotel and settle in. On day 6 of your 12 Jyotirlinga tour package, start your day with a delicious breakfast and check out of the hotel. Transfer to Aurangabad airport to board your flight to Indore. As soon as you land in Indore, transfer to Ujjain by road. As you reach, check-in to the hotel and relax. Enjoy your darshan at the Mahakaleshwar Temple on your 12 Jyotirlinga tour package. The lingam at this revered temple is believed to be born of itself. Post your darshan, head back to the hotel for your overnight stay. On day 7 of your 12 Jyotirlinga tour package, start your day with a healthy breakfast and check out of the hotel. Drive to Omkareshwar. As you reach, visit the sacred Omkareshwar Jyotirlinga on your 12 Jyotirlinga tour package. After the darshan, head back to Indore airport to board your flight to Hyderabad. As you land, transfer to the hotel and settle in. Rest for the remaining day to rejuvenate yourself and continue with your Dwadash Jyotirlinga Yatra the next day. On day 8 of your 12 Jyotirlinga tour package, begin your day with a lip-smacking breakfast. The first half of the day is at leisure. You can check out some of the top attractions of Hyderabad like the famous Golconda Fort, Charminar, and Hussain Sagar. In the evening, check out of the hotel and transfer to Srisailam by road. As you reach, check-in to the hotel and relax. You can check out the local markets or eatery joints if you wish to. On day 9 of your 12 Jyotirlinga tour package, start your day with a delicious breakfast and check out of the hotel. Make your way to Mallikarjun Jyotirlinga and enjoy your darshan of the pious lingam on your 12 Jyotirlinga tour package. After the visit, drive back to Hyderabad airport to board your flight to Madurai. As soon as you land, transfer to the hotel and relax. In the evening, you can visit the well-renowned Meenakshi Amman Temple on your 12 Jyotirlinga tour package and witness the ceremonies that take place in the evening. On day 10 of your 12 Jyotirlinga tour package, begin your day with a lavish breakfast and then check out of the hotel. Transfer to Rameshwaram by road. As you reach, check in to the hotel and settle in. The day is at leisure. 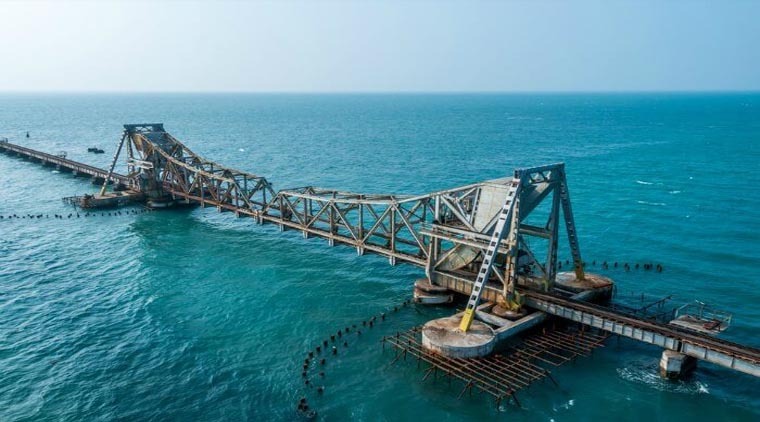 You can indulge in local sightseeing and cover some of the top attractions of the city on your Dwadash Jyotirlinga Yatra package like The Five-Faced Hanuman Temple, Dhanushkodi, and Gandama dana Parvatham. n day 11 of your Dwadash Jyotirlinga Yatra, start your day early and visit the pious Rameshwaram Temple at 4:30 in the morning. Enjoy your darshan of Spatika Lingam on your Dwadash Jyotirlinga Yatra. Post that, take a holy bath at Agni Tirath and other holy wells at the temple. On your Dwadash Jyotirlinga Yatra, visit the Rameshwaram Jyotirlinga and offer your prayers. Post the darshan, head back to the hotel. Enjoy a nice breakfast and then check out of the hotel. Transfer to Madurai airport to take your onward flight to Delhi. As soon as you land, transfer to the hotel and check-in. On day 12 of your Dwadash Jyotirlinga Yatra, post an early breakfast, check out of the hotel and make your way to Haridwar by road. As you reach, check-in to the hotel and settle in. Spend some time relaxing in the hotel before attending the evening Ganga Aarti at Har Ki Pauri on your Dwadash Jyotirlinga Yatra. Soak in the divinity that this pious city has to offer. After the aarti, you can even check out the nearby local markets to shop for souvenirs and other holy items. On day 13 of your Dwadash Jyotirlinga Yatra, enjoy a lip-smacking breakfast and then check out of the hotel. Make your way to Guptakashi by road. As you reach, check-in to the resort and settle in. The day is at leisure. You can explore it on your own. You can visit the many temples that Guptakashi is lined with like Ardhnareshwar Temple, Vishwanath Temple, and Manikaran Kund on your Dwadash Jyotirlinga Yatra. Head back to the resort for your overnight stay. On day 14 of your Dwadash Jyotirlinga Yatra, begin your day with a scrumptious breakfast and transfer to Guptakashi / Phata Helipad for boarding a helicopter to Kedarnath. As you reach, get priority Darshan tickets for your Kedarnath darshan that are available only for helicopter passengers. On your Dwadash Jyotirlinga Yatra, experience the spiritual vibes at the Kedarnath temple which was constructed by the Pandava brothers and later revived by the revered saint Adi Shankaracharya. After the darshan, reach back to Guptakashi / Phata helipad in the helicopter and from thereon, transfer to the vehicle to reach the resort. Enjoy your overnight stay at the resort. On day 15 of your Dwadash Jyotirlinga Yatra, post a delicious breakfast, check out of the resort. Transfer to Dehradun airport by road to catch your onward flight to Varanasi. As you reach, check-in to the hotel and settle in. The day is at leisure. You can explore the divine city of Varanasi and visit the temples, or take a stroll along the ghats on your Dwadash Jyotirlinga Yatra. In the evening, enjoy the Ganga Aarti at Dashashwamedha Ghat on your Dwadash Jyotirlinga Yatra package. On day 16 of your 12 Jyotirlinga Yatra, start your day early by visiting the famous Shri Kashi Vishwanath Temple. Offer your prayers to the Almighty and seek its blessings. You can later visit the Bhairav Temple on your 12 Jyotirlinga Yatra. Post the darshan, head back to the hotel. Enjoy your breakfast and then check out of the hotel. Transfer to Patna. As you reach, transfer to the hotel and check-in. Rest of the day is at leisure. You are free to spend it in exploring the city on your own. On day 17 of your 12 Jyotirlinga Yatra, post an early breakfast, check out of the hotel. Transfer to Deoghar by road. As you reach, transfer to the hotel, check-in and relax. On your 12 Jyotirlinga Yatra, visit the popular Baidyanath Jyotirlinga and offer your prayers. It is believed that devotees who visit this Jyotirlinga are relieved of all their worries and miseries in life. After the darshan, head back to the hotel for your overnight stay. Today is the last day of your Dwadash Jyotirlinga Yatra. Check out from the hotel and drive to Patna airport to board your onward flight back home. Accommodation on double/twin-sharing basis in the hotels. Meals, as mentioned in the detailed itinerary and costing that, shall be shared with you. All transfers and sightseeing as per itinerary by Vehicle as per the number of persons(Only land transfers). Driver allowance, parking, toll, interstate taxes. Goods & Service Tax at the prevailing rates. Items of personal nature like drinks, laundry, telephone calls, tips etc. Any other meals not mentioned in the itinerary or inclusions. Any guide fee, entrances, camera fee etc. Liability for change in itinerary due to reasons beyond our control. Any change in package price due to hike in fuel prices and government taxes. Any surcharges for super peak season. · Somnath Temple was built from 1947 to 1951 and was inaugurated by the then-President of India, Dr. Rajendra Prasad. · The temple finds mention in many epics like Bhagavat Gita, Skandapuran, and Shivpuran. · The walls of the temple are adorned with the sculptures of Lord Brahma, Vishnu, and Lord Shiva. · The temple opens at 4:30 a.m. and closes at 10:00 p.m.
· The temple remains open for general darshan from 6:00 a.m. to 3:30 p.m. and 6:00 p.m. to 10:00 p.m. free of cost. · MahamangalaAarti begins at 5:30 a.m. and 5:00 p.m. where the ticket fee is Rs. 200/- per person. 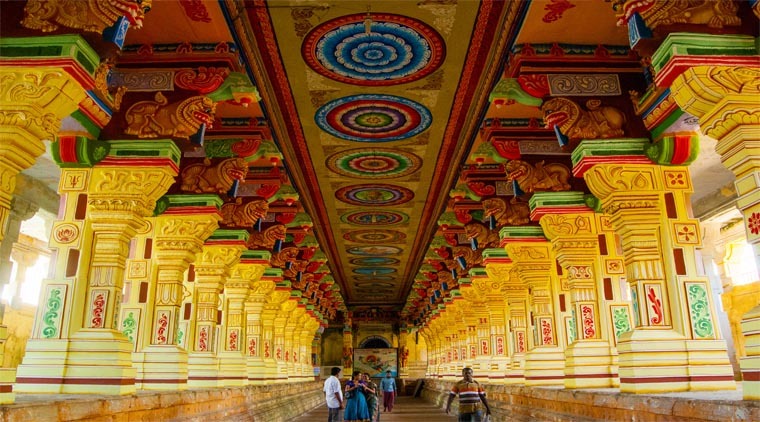 · The temple has 1,212 pillars and 22 teerthams. · The temple covers up an area of 15 acres. · The pillars of the temple are painted with snow-cem cement to prevent them from corrosion. · Temples – Durgakund Temple, Kathwala Temple, TulsiManas Temple. Before you undertake your 12 Jyotirlinga Package, it is advisable that you exercise regularly, especially breathing exercises like Pranayama. This would help in combating the lack of oxygen at higher altitudes. Carry some basic essentials with you on your 12 Jyotirlinga Package like sunscreens, moisturizers, mosquito repellents, and sunglasses. 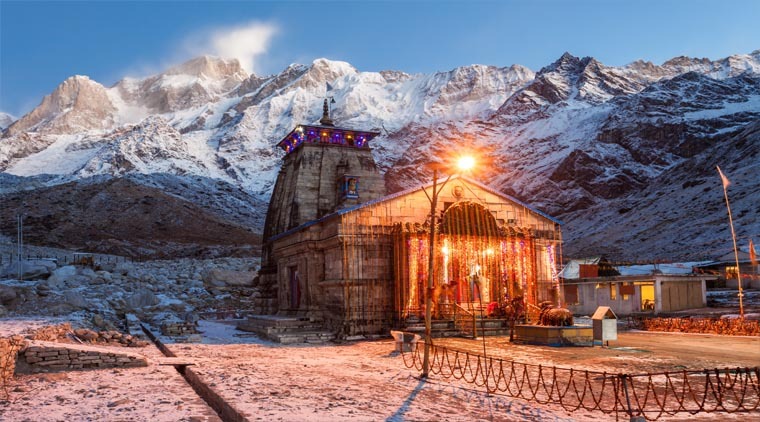 Owing to the higher altitude at places like Uttarakhand, it is advisable that you pack few woolen clothes on your 12 Jyotirlinga Package tour to combat the cold. Carry a mini first-aid kit with yourself on your 12 Jyotirlinga Package which can come handy in case of any emergencies. Some of the temples don’t allow the use of cameras inside the temple premises. Make sure you follow the rules of the temple when you visit. It is advised to dress appropriately while visiting the mythological sites. On your 12 Jyotirlinga Tour Package, avoid carrying heavy luggage as it tends to become a deterrent in your journey. Keep your identity proof and other important documents with you at all times as it might be useful during an emergency. On your 12 Jyotirlinga Package, always carry bottled mineral water with you and don’t drink tap water as that could lead to water-borne diseases. Avoid wearing too much jewelry on your pilgrimage as it is not safe. Keep yourself as light and easy as you can.